I have to share, because someone told me that when their back is against the wall is when they do their best work. I believe this to be the most brilliant excuse for laziness that I have yet to hear. What then are we doing the rest of the time? Being slothful and doing nothing if we must have our back against the wall to move. I am seriously not impressed. 6 Go to the ant, O sluggard;consider her ways, and be wise.7 Without having any chief,officer, or ruler,8 she prepares her bread in summerand gathers her food in harvest.9 How long will you lie there, O sluggard?When will you arise from your sleep?10 A little sleep, a little slumber,a little folding of the hands to rest,11 and poverty will come upon you like a robber,and want like an armed man. I like to dissect things to get a clearer picture one thing about the ant is that when you watch them they are never out of sinc, and they are orderly. If you look closely there is one line going to and one line moving from so that there is never one time that a work is not going forth. Hence, we see that the ant works, walks it out continuosly. 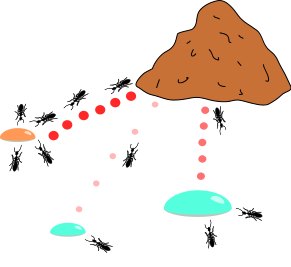 However, in the event that I would throw something like a pebble in the midst of the flow the ants scattered and I need to be aware that I can’t stand there because they will attack me…we all know what that is like. Moreover, if I leave and come back later they are right back at it…nothing out of sinc and it is as if nothing ever occurred. We see also the ants cover a broad area when working. Where is the man whose back is against the wall? In one spot stuck and un-moving. How is it then that man needs his “back against the wall” to take action? This is why things don’t go well. In my earlier example there are always two lines from and too..this says that they go gather and they store, gather and store and when problems come (a stomp) they might be off balance for a minute but they are not defeated. Neither should we be. The men and women of God must fight continuously and this can’t be done with our backs against the wall. Posted on September 6, 2012, in Life, spiritual, Work and tagged Ant, Ant colony, Consider Her Ways, Deborah M. Gordon, Foraging, GOD, Red harvester ant, Superorganism. Bookmark the permalink. Leave a comment.